IT will take a death or injury before the RTA takes responsibility for a dangerous footpath outside <?xml:namespace prefix = st1 ns = "urn:schemas-microsoft-com:office:smarttags" />Newport Public School, Opposition Leader John Brogden said yesterday. The Pittwater MP said the RTA and Roads Minister Carl Scully were refusing to install a fence along Barrenjoey Rd because there was no record of accidents there. 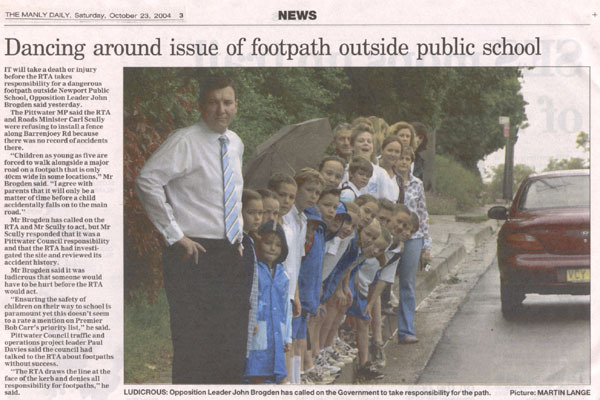 "Children as young as five are forced to walk alongside a major road on a footpath that is only 40cm wide in some locations," Mr Brogden said. "I agree with parents that it will only be a matter of time before a child accidentally falls on to the main road." Mr Brogden has called on the RTA and Mr Scully to act, but Mr Scully responded that it was a Pittwater Council responsibility and that the RTA had investigated the site and reviewed its accident history. Mr Brogden said it was ludicrous that someone would have to be hurt before the RTA would act. "Ensuring the safety of children on their way to school is paramount yet this doesn't seem to a rate a mention on Premier Bob Carr's priority list," he said. Pittwater Council traffic and operations project leader Paul Davies said the council had talked to the RTA about footpaths without success. "The RTA draws the line at the face of the kerb and denies all responsibility for footpaths," he said.